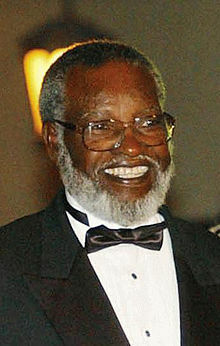 Samuel Daniel Shafiishuna "Sam" Nujoma (/nuːˈjoʊmə/; born 12 May 1929) is a Namibian politician. He was the first President of Namibia from 1990 to 2005. ↑ "Nujoma succeeded by Pohamba", AFP (IOL), 30 November 2007. This page was last changed on 22 April 2019, at 17:34.